The Law Office of Monte J. Robbins, Esq., is dedicated to providing aggressive and experienced representation exclusively in DUI, Criminal, Traffic Charges, Juvenile Matters, and Motor Vehicle and Administrative Hearings throughout the State of Colorado. Mr. Robbins is a firm believer that maintaining a highly focused law practice is critical to obtaining optimal results for his clients. He understands that the cases he handles often times have far-reaching collateral consequences beyond just the court case itself. As an aggressive Denver DUI lawyer, Mr. Robbins treats every case that he accepts as a very serious matter and fights hard for his clients. Mr. Robbins has in-depth knowledge and experience in the Metro Denver and Northern Colorado courts and maintains offices in Denver, Greeley, and Fort Collins to best serve his clients. The firm’s Denver office is located near City Park in downtown Denver, Colorado at 17th and High Street. The firm’s Greeley office is located in the Greeley Building, right next to Union Colony Civic Center in downtown Greeley, Colorado. The firm's Fort Collins office is located in the same building as the First National Bank of Omaha at the corner of South College Avenue and East Boardwalk Drive in Fort Collins, Colorado. The firm accepts cases statewide in any Colorado District, County, or Municipal Court. Because Denver DUI lawyer Monte J. Robbins is a sole practitioner, he will personally handle your case from start to finish and not pass your case on to an inexperienced associate. Mr. Robbins’s approach to any case starts with a thorough interview with the client, a detailed investigation of the facts and evidence, a broad comprehension of relevant statutes and case law, and a proactive strategy of defense. 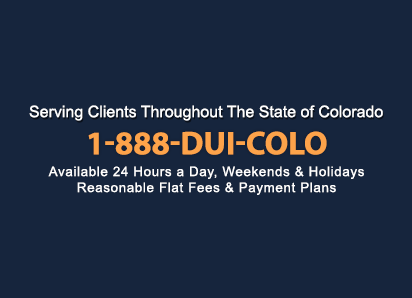 If you have been charged with a DUI, Criminal, Traffic or Juvenile charge anywhere in the state of Colorado, or need experienced and aggressive representation in a Motor Vehicle Hearing or other Administrative Hearing, contact Denver DUI attorney Monte J. Robbins for a free case evaluation at 303-355-5148, 970-301-5541, 970-329-1833, or toll-free at 1-888-384-2656. Se Habla Espanol.